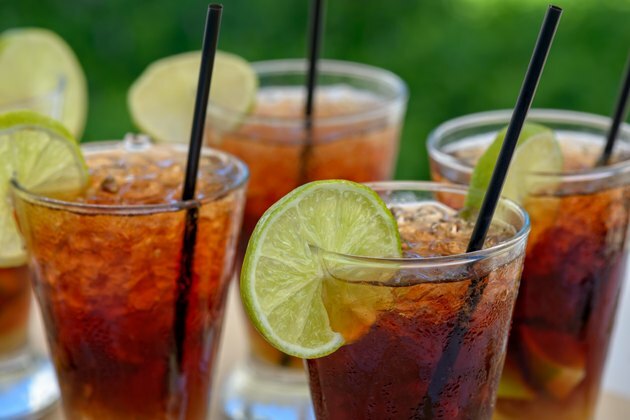 A rum and Coke is a cocktail known by nearly every bartender. The caloric values will be taken from roughly 4.5 oz. of Coca-Cola Diet and 1.5 oz. -- the standard shot size -- of Bacardi Rum. Typically, cocktails are served in a 10 oz. tumbler, two-thirds of which is filled with ice. Remember to always drink responsibly. In 4.5 oz. of Coca-Cola Diet, there are zero calories. There are additional chemical additives to the soda and caffeine is still present. In 1.5 oz. of Bacardi Superior Rum there are 97.5 empty calories from alcohol. Calories from alcohol are absorbed and a small portion are turned into fat, while the rest is turned into acetate that inhibits the body from burning fat. Thus, this causes more fat to be stored while acetate is in the bloodstream. Having 4.5 oz. of Diet Coke and 1.5 oz. of Bacardi Superior Rum will maintain a total caloric intake of 97.5 calories, as only the rum is counted. In comparison with 4.5 oz. of Coca-Cola Classic and 1.5 oz. of Bacardi Superior Rum, you would consume a total of 150 calories per drink; that's 7.5 percent of the standard 2,000-calorie a day diet in only one drink. Drinking a cocktail with Coca-Cola Classic is about equal in calories as drinking a whole can of Coca-Cola Classic alone, which is 140 calories. If you enjoy a rum and Coke and don't wish to sacrifice flavor, substitute Diet Coke with Coke Zero; its flavor is more similar to Coke Classic. Coke Zero and Diet Coke both have zero calories.